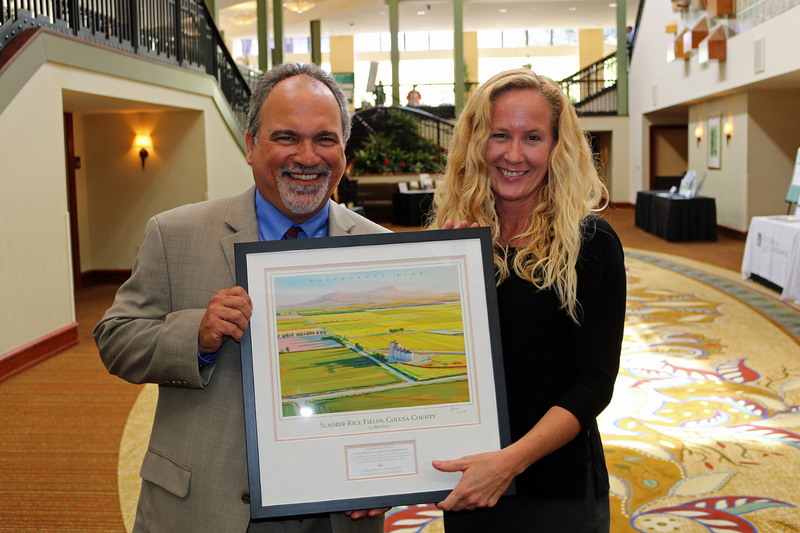 Catherine Hickey, Conservation Director of Pacific Coast and Central Valley at Point Blue Conservation Science, received the California Rice Commission’s Circle of Life Award on June 22, 2015. This award is given to individuals who have tremendously helped the California rice industry. She was honored in front of over 160 legislators, rice growers, and others for her leadership in finding innovative ways to manage rice for waterbirds and other benefits while enabling the rice growers to participate in wildlife friendly practices. Dave Shuford (right) is presented the Science Excellence Award by Mike Dunphy (left), coordinator for the Central Valley Joint Venture, and John Carlon (middle), president of River Partners and Central Valley Joint Venture board member. The comeback of the White-faced Ibis. The shift from burning rice fields to flooding them. Black terns breeding in the Tulare Basin after a decade-long absence. Dave Shuford has witnessed a few things in his time as an avian ecologist in California. This also is only a peek into why Shuford recently received the 2014 Science Excellence Award from the Central Valley Joint Venture, a coalition of 21 state and federal agencies and organizations working over the past two decades to provide habitat for resident and migratory birds in the Central Valley. For several decades, Shuford has led aerial and ground bird surveys with the goal of “trying to count everything on all flooded habitat.” He has spent countless days studying birds up close and monitoring their habitat needs. He has written extensively on waterbirds (he authored the BCR 32 Waterbird Conservation Plan, which covers the Central Valley and much of the coast of California), provided technical advice for numerous conservation projects and served as a spokesman to the media, including a recent public radio news story about the effects of California’s ongoing drought on birds. Through this time and hard work, Shuford has seen changes on the landscape firsthand. Shuford also has documented weather fluctuations and the effects on birds. He says he found it amazing to see all the birds coming back to the Tulare Basin, at the southern end of the Central Valley, following the El Niño winter of 1997-98. 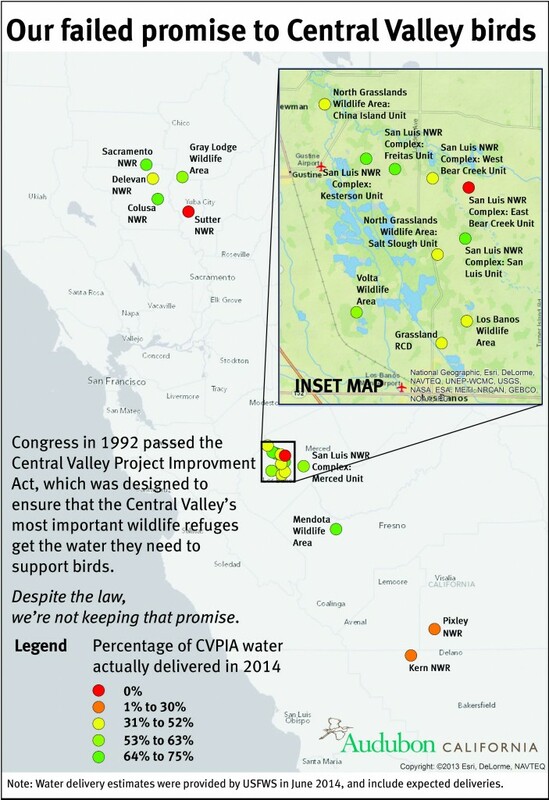 The Tulare Lake complex was the largest wetland system west of the Mississippi River 200 years ago. 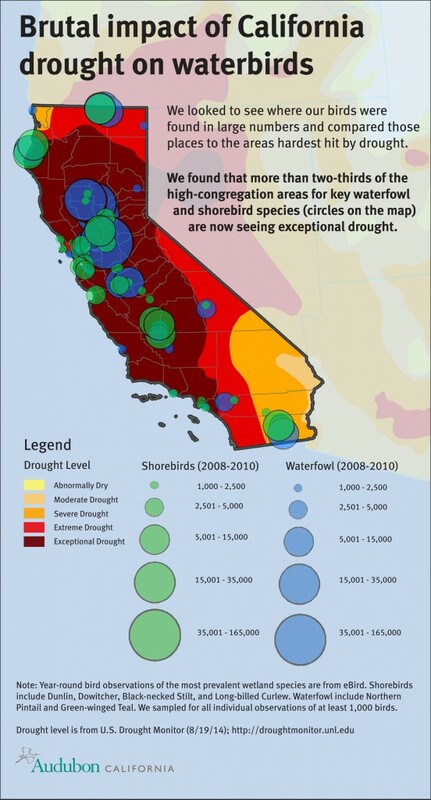 By contrast, Shuford watched the drought in the Central Valley detrimentally affect many of the waterbirds during 2009-2012. He says only half of the Black Terns came back and Caspian Terns didn’t breed at all. When funding is available, Shuford says it’s important to conduct surveys every year to understand population trends, habitat-use patterns and the potential effects of climate change on waterbirds. And he says he hopes to continue this work well into the future. 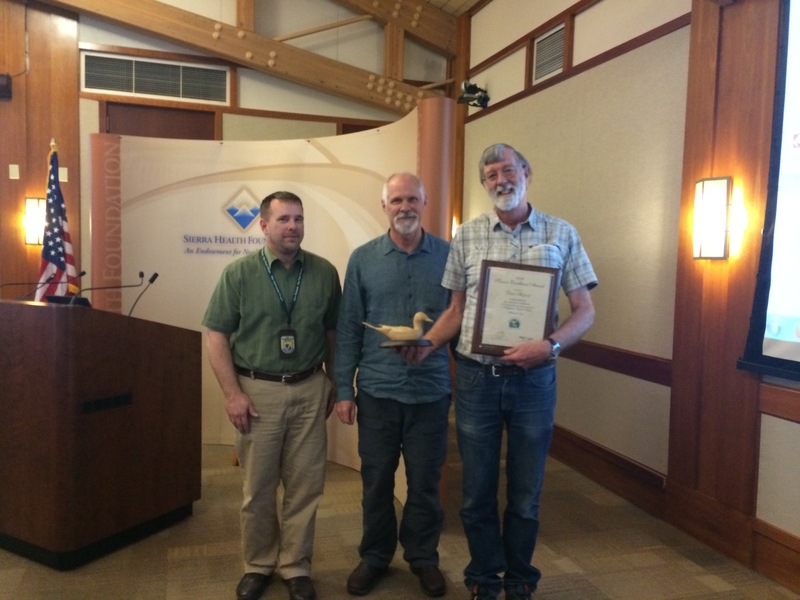 In the meantime, while his colleagues are recognizing his contributions to bird science and conservation, Shuford makes it clear that much of his work reflects the support and collaboration of many others, particularly fellow ecologists Gary Page and Catherine Hickey of Point Blue. The award is really a group award, he says. This story originally appeared on 3/16/2015 at Point Blue’s Science for a Blue Planet blog. Even though it is one of the most spectacular landscapes in the continental Unites States, the Lower Klamath National Wildlife Refuge is perhaps one of the most underappreciated and unknown natural places in the West. Relatively few Californians are aware of this state treasure and few in Congress or the Administration seem willing to step up to help it. That’s unfortunate, because the Lower Klamath needs help. Drought has reduced water deliveries to a trickle and left the refuge parched, forcing migratory waterfowl and other birds to crowd onto what little water there is on nearby Tule Lake. This type of overcrowding often results in the fast and easy spread of disease, and already biologists are documenting the deaths of thousands of birds from avian botulism. This kind of die-off so early in the season doesn’t bode well. We could be looking at a major catastrophe if something isn’t done soon. Great horned owls hang out at the San Luis National Wildlife Refuge. Swift, silent and scary, these winged terminators hunt critters at night. And duck is on the menu. Don’t be fooled by the happy honking geese and dancing sandhill cranes. This may seem like a happy winter pit stop for migrating birds, but owls and other predators can quickly deal a lethal blow to a good time. It’s a risk these birds face every year as they fly south from frigid Canada and Alaska. But this year, predators may be the least of the worries for these birds. Starvation, avian cholera and botulism may be bigger killers than usual. 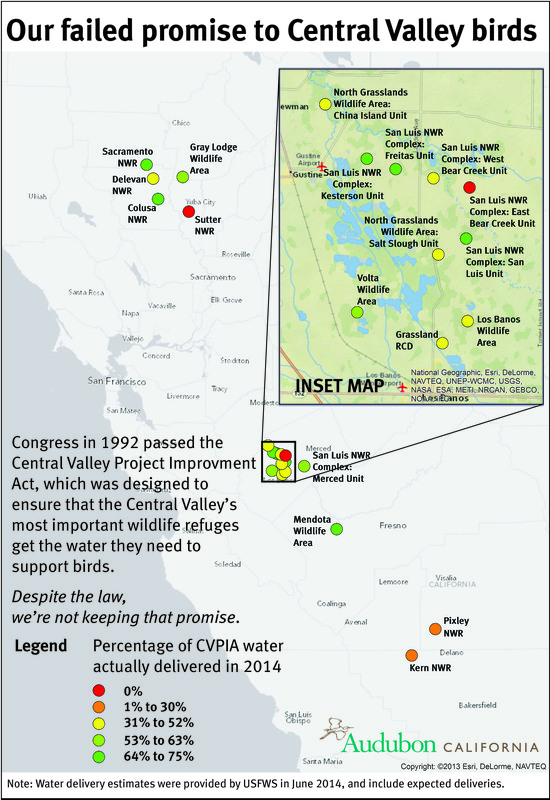 It’s another dark twist from California’s destructive drought. When the birds make their annual arrival this fall and winter after flying thousands of miles from the north, they will find drought-depleted wetlands on the west side of the San Joaquin Valley. Authorities don’t have the water to maintain about half of the wetlands. For the swirling flock of migrating shorebirds banking to a landing in California’s Central Valley, a recently flooded rice field is providing a new kind of triage station during a drought that’s drastically reducing places where they can rest on their long journeys. The new arrivals to the field — hundreds of them — are dowichers, says conservationist Greg Golet, standing on a dirt berm and focusing his binoculars to identify a wading bird that is one of the first to fly south in an annual migration that brings 350 species to California’s Sacramento and San Joaquin valleys. With millions of birds on their way from the Arctic and subarctic and the drought cutting critical wetlands to as little as one-sixth, the field is one of the first to come on line this fall under a new program of “pop-up” habitats. Conservationists are temporarily renting 14,000 acres from rice farmers and flooding them just long enough to give the migrating birds the rest and food they need to survive their flights.